Digital coupons are coming to Apple Watch courtesy of Valpak, which is releasing a new app for download to the wearable device. Apple Watch owners who download the Valpak app can find coupons for stores and services within a 25-mile radius of their location, with a large selection of discounts for local services in categories like restaurants, health and beauty, and automotive. The user can scroll through services, choose an offer and get directions. The app will display a unique coupon code on the screen, which the user can show to the store clerk to redeem. The Valpak app is compatible with Apple’s mobile wallet app Passbook, as well as mobile wallets from Samsung and Google, so coupons can also be downloaded and stored ahead of time; the coupons will then pop up on the watch screen when they are near the participating business. 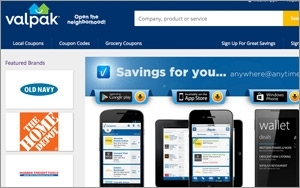 Like other big coupon publishers, Valpak has been following the rise of mobile commerce and payments closely in recent years. In 2013, for example, it introduced an augmented reality feature that enables consumers to see which nearby businesses have coupons on offer by simply holding up their smartphone to the horizon. Media firms of all kinds are rushing to introduce apps for the Apple Watch. Also this week, ABC News debuted its Watch app, with features including “Stories in a Second,” news radio programming, customized news updates enabling the user to follow particular topics and live video. The latter feature allows wearers to “hand off” the video from their watch to their iPhone for viewing with the ABC News app.